One of the fruit beer “facts” often thrown around is there are some fruits that just don't translate well, strawberries, banana, and peaches (use apricots instead!). In Radical Brewing Randy Mosher writes “Peaches have been, in my experience, a terrible disappointment. The taste of the finished beer is rather flat and somewhat gummy, very different from the intense bouquet of fresh peaches.” After having a couple of delicious peaches beers (New Belgium Eric's Ale and Dogfish Head Festina Lente) I knew this couldn't be the whole story. I had originally planned on adding some flowers to the secondary of my batch of Sour Honey Wheat beer, but after eating some delicious peaches from the local farmers market last August my mind was changed. I used the same ripe white peaches (sliced, stones removed, skins left on), around 2.5 lbs per gallon (more than I do for most fruit beer combinations). Five months later I racked the beer off the peaches to give it a few months to clear before bottling. The resulting peach character is wonderful, bold, fresh, and most importantly peachy! Appearance – Pours a hazy golden yellow with a thin white head that lasts only a minute or so. Smell – The nose is fresh peaches, with some other fruit (Melon? Lemon? Apricot?). There is a touch of floral/honey dancing behind the fruit. Minimal funk/alcohol (no hops, obviously). Taste – Piquant acidity coats the tongue and the roof of the mouth. The peach flavor starts midway through and lingers into the finish, the peaches taste fresh and vibrant. The honey/waxy character is again there in the background. I could have used a bit more funk/complexity, but the balance of fruit and acid has its charms as well. 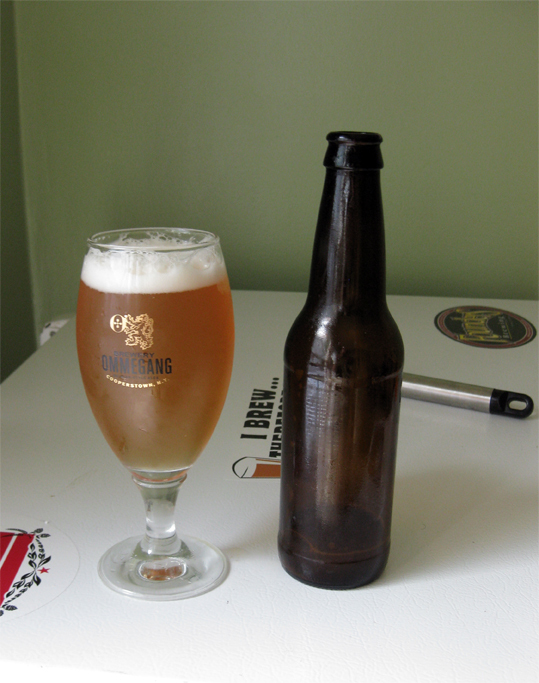 Mouthfeel – Moderate carbonation, certainly could be higher to compliment the sourness. The body still has a bit of heft, but the acidity provides a bit of astringency to balance it. Drinkability & Notes – I'm impressed by how well the dosed food grade lactic acid worked in this beer. I'm not sure how this beer would compare if it was just fermented with a clean ale yeast, I can't tell if some of the complex fruitiness is from the bugs or just a result of the fruit. I just tried Eric's Ale at a local establishment, and it was exactly what I was looking for on a hot summer day. I had to go back for a second and encourage my friends to get their own as well. What do you think they used to sour that one? It tasted relatively clean, so just lacto? Sour mash? Food grade lactic acid at the end? I also just tried the DFH Festina Peche. I wasn't expecting very much from previous mixed reviews, but it grew on me and my wife quite a bit! As a weiss base it did taste lighter and less sour than Eric's. I am planning on adding some white peaches to my latest p-lambic. At 2.5 pounds per gallon, what did you ferment 5 gallons of beer with that much fruit in? I am thinking with that much fruit in a 5 gallon carboy I will have to do more like 4 gallons with a gallon worth of fruit. Nice to hear you had good luck!! Only ~2-2.5 gallons of the base beer went onto the peaches (in a 3 gallon better bottle) the rest was bottled as is without fruit (I almost never fruit an entire batch). You might be able to get away with a 6 or 6.5 gallon carboy, or leave some plain for blending if you need to knock the peach character down (or to compare). Looking at 5 pounds of white peaches that are not quite ripe. They are hard, but have good flavor and aroma. Do you think the fruit needs to be soft to quilify for a dunk in the beer? I think ripe fruit is the best choice (I forget if peaches are one of those fruits that continue converting starches to sugars as they ripen), give it a couple days and they should soften up.